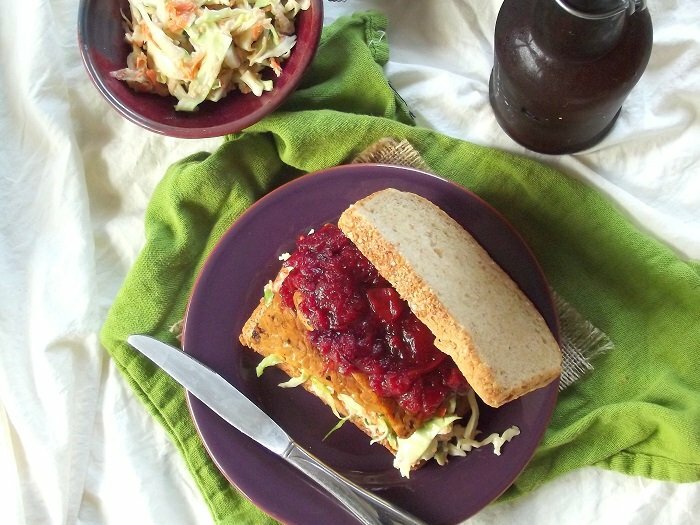 This vegan Thanksgiving sandwich is made with crispy grilled tempeh piled with spicy cranberry apple sauce and apple cider tahini slaw! This is the recipe I was alluding to earlier this week in my apple cider tahini slaw post. I hope I didn’t spoil it for anyone! But I hope I convinced a few folks to make the slaw, if not for this recipe, just for the mere fact that the slaw is tasty business. Now, you don’t have to make the slaw, or the spicy cranberry apple sauce for that matter, in order to produce some version of this sandwich. You could really use whatever cranberry sauce you have leftover after the holiday, along with some variety of slaw, or salad, even if it means just tossing some bagged lettuce with oil and vinegar. 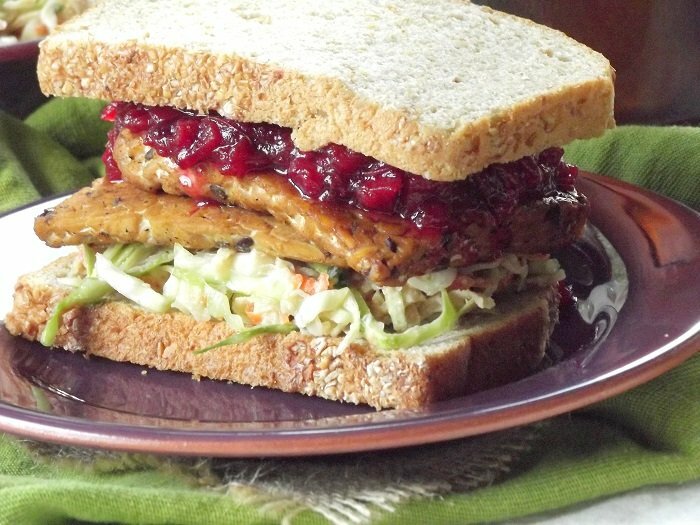 The tempeh is the important part of this sandwich, as it stands in for turkey, which has for years stood in the way of me being able to partake in an Thanksgiving leftover sandwich. No more! 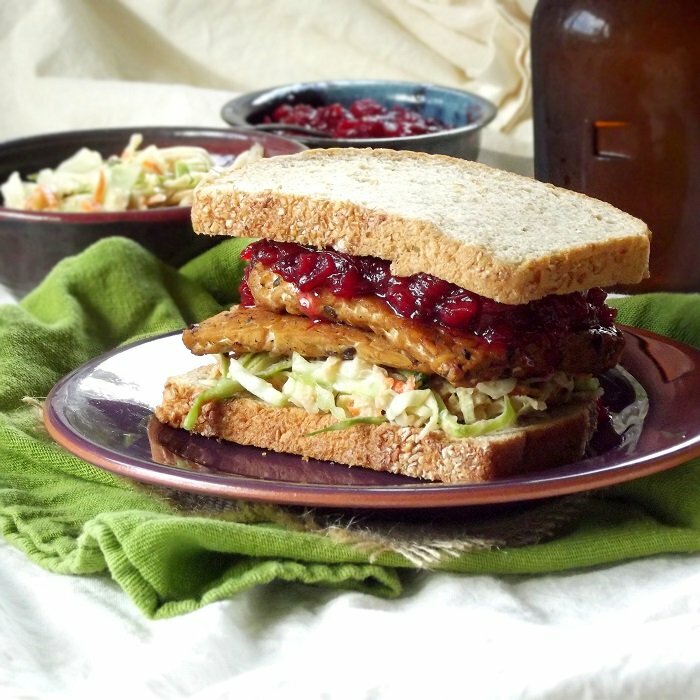 Tempeh makes an awesome vegan Thanksgiving sandwich, even if the tempeh itself doesn’t come from your holiday feast. It’s crispy on the outside, savory on the inside, and goes great with the spicy jalapeno flavor of the cranberry sauce, as well as the gingery notes in the slaw (my last ditch effort at convincing you to make them). Whatever sides you go with, pile ’em on these tempeh slabs and I’m sure they’ll be crazy delish. Stir broth, soy sauce, maple syrup, paprika and liquid smoke together in small bowl. Slice tempeh in half thickness-wise, then width-wise. Place in a shallow dish and pour marinade over top. Optionally, marinate for up to 4 hours. Coat a large skillet with vegetable oil and place over medium high heat. 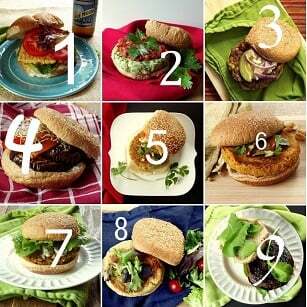 Working in batches if needed, arrange tempeh slabs in a single layer in skillet, reserving marinade. Cook until browned on bottoms, about 5 minutes. Flip and cook until browned on opposite sides, about 5 minutes more. Pour reserved marinade over tempeh and cook another minute. 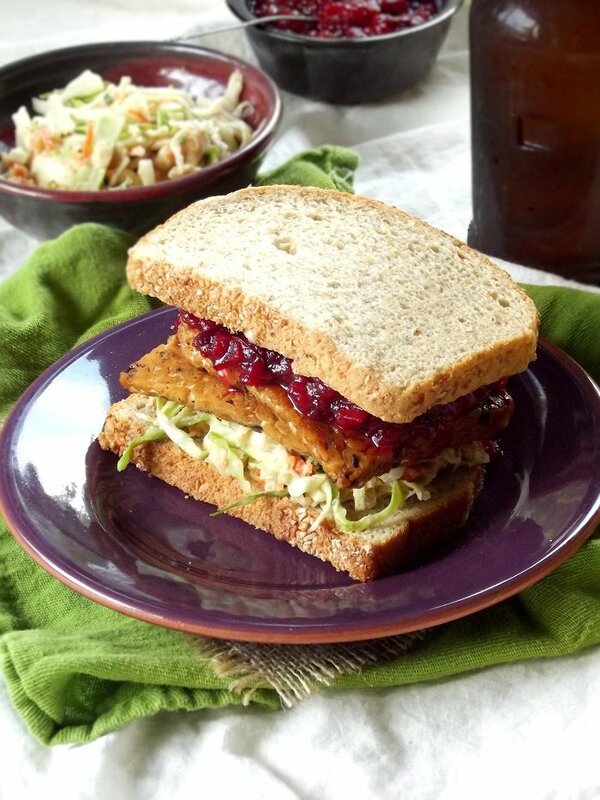 Assemble sandwiches by layering tempeh with cranberry sauce and slaw. Looks similar to our tempeh reuben that we make quite a bit. It’s always fun to try something new with tempeh since eventually I would like to compile a tempeh recipe book. Eventually our dream of a tempeh incubator will become a reality sometime next year so keep in touch via our website for important happenings in the world of tempeh. I just want to let you know that I think this is the most delicious thing I have ever had!!!!! I’m typing this with one hand bc the other hand is holding the wrap of goodness together ;) Thanks for posting such an awesome recipe!! !